Almost any kind of shirt in any given niche will sell here just because Amazon has such a large audience. The bonus is that the shirts are part of the popular Amazon Prime program. That means members can get their shirt shipped in just 48 hours! Here’s a quick video showing a really solid 7 days worth of earnings from sales in a handful of niches. I was on the 25 tier at this point. I posted that video to show credibility. Since I am going to be selling courses on this site, it’s important for me to show people that I am actually walking the walk and not just talking the talk. This was an exceptional week. I was only on the 25 tier but I had 2-3 shirts that went NUTS for several weeks so my earnings skyrocketed for a short time. I earned $900 in January 2017, and then my earnings increased 7 fold in February ($6,000+) thanks to Valentine’s Day sales. Sign up for Merch by Amazon. Zazzle has a variety of products you can add your design to. You can allow customers to further customize your design by adding text. The customization aspect is what really draws customers to this marketplace. Just like Zazzle, Spreadshirt lets people add designs to all kinds of products and not just T-shirts. They also allow customization and even profanity. 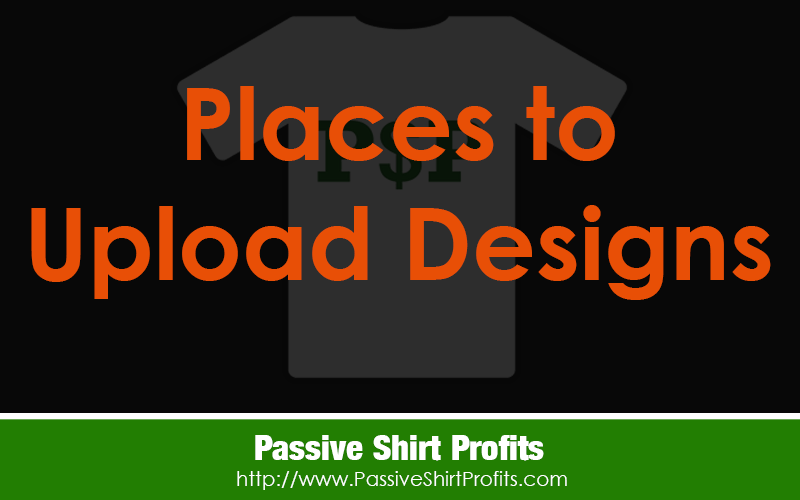 So if you want to upload some edgier shirts, this is the place to go. There’s some serious art on TeePublic! While originally created for fan art and independent artists, you can also find a wider variety of designs on this platform as they continue to reach new audiences. This is another site that was created for independent artists to showcase their talents. Browse their marketplace and you will see a variety of abstract art. These kinds of designs perform very well in the marketplace. Having said that, I have sold a few simple political and random topic shirts here. If you have a lot of artistic talent, this is the place to upload! SunFrog is one of my favorites in terms of ease of uploading. Some platforms (Spreadshirt and Zazzle) have quite lengthy upload processes and it can get tedious. SunFrog is one of the faster, intuitive POD sites. They also encourage their visitors to join their affiliate program so your designs can also be promoted by other affiliates. If you want other people to promote your shirts, this is the place to go. This is one of the original POD websites that’s been around for AGES. This was the very first site I uploaded to years ago. Just like many of the other POD sites, they offer T-shirts, mugs, phone cases, stickers and more. Hello Lisa.If i create for example 1000 design can i upload it on all sites together?For example the same design on Amazon Merch,Redbubble,Teepublic,Sunfrog, etc or i must to create differents designs for each marketplace please???? There are some bulk uploaded out there for multiple sites. Haven’t tried any yet. But google bulk uploads for POD to read up on them. What is your feeling about Teespring vs. Sunfrog. We loaded our designs on both and had sample shirts printed. Pretty much same quality. What I wonder is about the ease of working with one or the other. Any wisdom to share??? Hi Harold. I have never done much with either site. I was getting some organic sales on Teespring for a while but haven’t uploaded lately. I had zero success with Sunfrog.